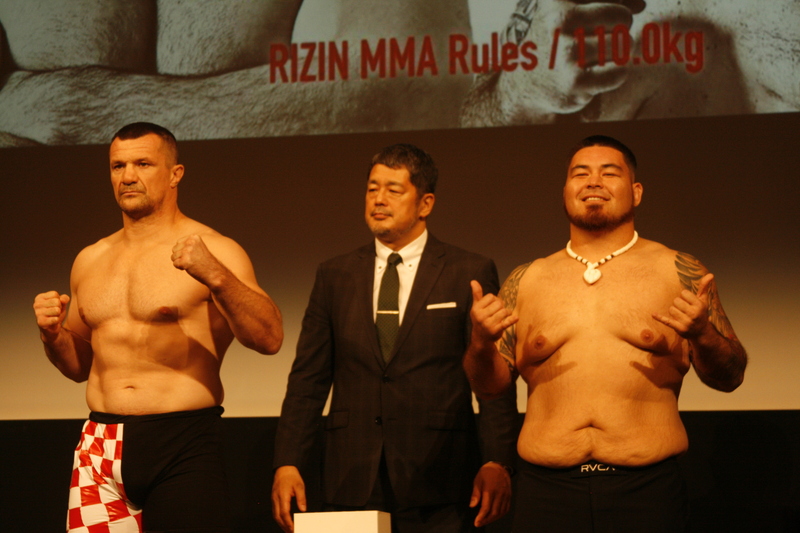 TOKYO, Japan – Roque Martinez came in one kilogram under the max weight (110 kg) in his heavyweight showdown with MMA legend Mirko ‘Cro Cop’ Filipovic heading into Sunday’s Rizin 13 at the famous Saitama Arena. Martinez needed to come in at 242 pounds. Instead, he took off three more pounds for good measure. A stoic Filipovic throughout the weigh ins tipped the scale at just a pound more than Martinez – 109.45 kilos, to be exact. The official weigh ins happened earlier in the morning with the ceremonial weigh ins taking place at the Fuji Television Multi Theater in Odaiba. The fight on Sunday is just two rounds, but the first round is 10 minutes while the second round is five minutes. The fight card gets underway at 5 pm CHamoru Standard Time with the big fight projected around 7:30-8 pm. Tune in to GSPN’s Instagram and Facebook pages for all the latest. Martinez has along the usual support from his Spike 22 fight camp to include head coach Melchor Manibusan, manager Tony Bashaw, Mark Mendiola, Albert ‘The Real Coach’ Borja, Scotty Duenas, Joey Crisostomo, Justin Benavente, Paulette Saures and Jon Tuck. Also here for support are the likes of Lad Deleon, Erik Flores, Gus Flores, Mike Taijeron and others. Teammate Kyle Aguon is also in town as the head coach for Miyuu Yamamoto, older sister of Kid Yamamato, who is also on the fight card. The Guam fans and Spike 22 family are in full support here in Tokyo for Roque Martinez.